The Totnes Riverside (Littlehempston) Station has been built on land which was originally a field. Prior to 1962 all the trains running on the Ashburton to Totnes branch used the line which still exists, through the large white gate, to connect the present South Devon Railway to the National Network. The trains used this connection to reach the main line platforms and goods shed. This connection does still see occasional use for incoming and outgoing engines and trains. Most movements to and from the South Devon Railway are today effected by the use of low load lorries at Buckfastleigh. The Main Station Building houses the Booking Office and Waiting Room, with a small room for the Station Master to prepare that stalwart of all railway operations, the tea! This was "found" in 1981 by the London Group of members of the original Dart Valley Railway Association (which later became the South Devon Railway Association in 1991). This building originally stood at Toller Porcorum on the Dorchester to Bridport branch of the GWR in Dorset. The branch was closed during the Winter of 1980. The building was dismantled and brought initially to Staverton by road before onward transport to Totnes (at that time named Riverside). The foundations were in full swing in 1984, but the building was erected around 1986. As most of the work was being carried out by members of the London Group, progress was somewhat limited by what time and money they had available. 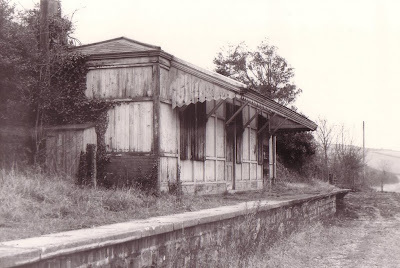 The next building is known as the Bovey Hut, as it was transferred to Totnes RiversideL (Littlehempston) from Bovey Tracey on the former Newton Abbot to Moretonhampstead branch line. It served there as the bus shelter. The lower picture shows assembly in progress at Totnes Riverside (Littlehempston) on 13th January 1991. 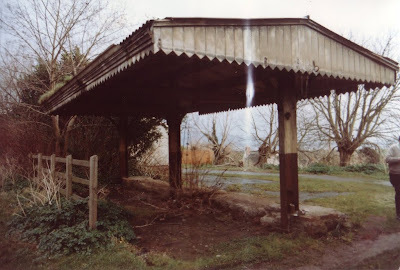 The Axbridge Canopy was transferred to the present location having protected, amongst other things, the strawberries awaiting shipment from the Cheddar Valley line, near Bristol. The Upper picture taken 6th December 2006. The lower picture was probably taken around Christmas time 1988. 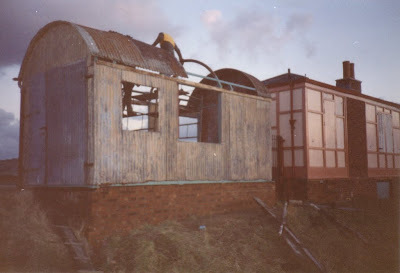 Dismantling started on 31st March 1989. The constituant parts arrived at Staverton (for onward transport) in the Winter of 1990. See Bulliver Nos. 105, 107 & 111. There is a supply of back numbers of Bulliver available in the "Monster" which can be seen in the background of the picture below. The Toilet Block, with two cubicles for ladies, one cubicle and two urinals for gentlemen, a baby changing room and a toilet for the disabled, was built to give the appearance of being a GWR building. This picture taken 22nd July 2011. Lamp Hut. This picture taken 22nd July 2011. Pilning Box. This picture taken on 23rd July 2011. The windows are now fitted, and now that the painters have complete their part of the job, we will need to post a new picture. Ashburton Junction Signal Box. The box originated at Cradeley Heath, but the Totnes Riverside (Littlehempston) Group recovered it from the Birmingham Railway Museum at Tyseley. This entailed several visits to plan and dismantle it, with parties of members staying overnight, and of course the hire of vehicles and cranes to bring it initially to Buckfastleigh, for eventual transportation down to Totnes. Water Crane and Tank. The water crane came from Leominster, in Herefordshire. These pictures taken 23rd July 2011. The water crane was erected around 1996, and the water tank concrete base constructed on 30th November 2006 using a large number of volunteers, mixing the materials with several mixers. The erection of the tank itself (built in our own Buckfastleigh Workshops) commenced on 12th December 2006. The South Devon Railway Association had authorised a sum of £10,000 towards the project, but this was subsequently increased. Phone Box. Placed into an upright position adjacent to the approach path on 17th March 2011. Next time you walk past the box, look inside and see the latest addition - a 3D poster which is so realistic that you feel like trying to press Button B. Unfortunately the first poster suffered from fading, and has been replaced, with an encapsulated version, which doesn't seem to have quite the same 3D effect, but don't let that stop you looking! The former Trolley Maintenance Depot (TMD) which stood for years at Staverton, has now been rebuilt at the back of the sidings. The building provides increased dry storage and working area facilities for the Station maintenance team.